Buy-side cover interview – Curiosity is the key to survival in the world of FICC (Fixed Income, FICC trading at BNP Paribas Asset Management, knows this better than most. Yann Couellan speaks to David Whitehouse about his career so far and what still excites him about the future. MiFID II: Fresh start or false dawn? 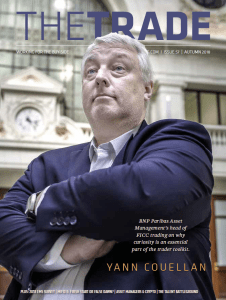 – John Brazier examines how the industry has adapted to the new trading environment following the much-anticipated implementation of MiFID II and where the major issues facing market participants are set to continue. Financial firms searching for control amid Brexit chaos – With less than a year until the United Kingdom is due to officially depart from the European Union, Hayley McDowell examines where the financial services industry stands in the swirling Brexit chaos as the clock ticks down to 29 March 2019. Targeting talent: The industry’s new battleground – Attracting and retaining the brightest talent available has become the new battleground for investment banks as new compliance obligations and technology developments create warring factions desperate to secure the best personnel possible. Hayley McDowell tells the story behind this method of attack and finds out that a talent shortage could be just on the horizon for major players. The TRADE’s (unofficial) M&A awards 2018 – This year has seen some of the biggest deals inked between major players, shaking up the market structure and bringing with it a potentially huge impact on the future of trading. Hayley McDowell reviews the mergers and takeovers that are already causing a stir in the industry. The reality of asset managers and cryptocurrencies – The exploration of cryptocurrencies from asset managers should not always be taken as a sign of intent, more just what you’d expect from the biggest players in the financial markets, writes Jonathon Watkins. The big interview: Diana Chan – As the long-standing chief executive of EuroCCP, Diana Chan, steps down from her role, Hayley McDowell asks about with the company and what she believes the next decade holds for clearing. The 2018 execution management survey – MiFID II may have changed the game when it comes to execution management, but trading efficiency will always come first. The 2018 algo survey provides an insight into how asset managers are now looking beyond compliance when it comes to their execution management systems providers.